Russian President Vladimir Putin on Monday sought guarantees from the United States that a U.S. missile defense shield is not targeting Russia. According to a presidential decree signed by the newly inaugurated president on Monday, Russia will "consistently stand up for its policy towards the creation of the U.S. global missile defense system." The country is "seeking guarantees that it will not be directed against Russia's nuclear deterrent forces," said the decree which focuses on the country's foreign policies. Meanwhile, Putin instructed the government to take measures to seek "stable and predictable interaction" with the United States and close ties with the European Union. On relations with China, Putin called on both countries to deepen their strategic partnership of coordination. The new president also said Russia would play a bigger role within the framework of the G8, the G20, the Shanghai Cooperation Organization and the BRICS. Putin was sworn in on Monday as Russian president, starting his third term in the Kremlin following completing two consecutive terms from 2000 to 2008. The 59-year-old political veteran, who served as prime minister from 2008 to 2012, signed a series of decrees on Monday, which cover a wide range of issues including economy, foreign policies, military and population. 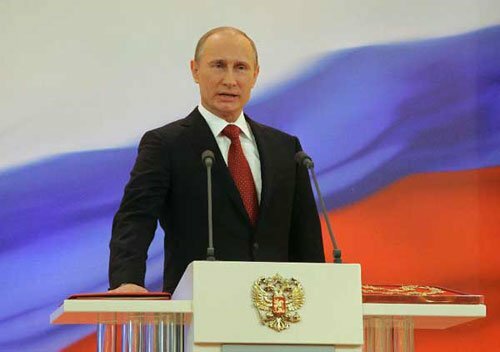 After winning the elections in March, Putin pledged that his first presidential decrees would outline the road map of Russia's development for the next decades.